Once again, scientists have confirmed something that any woman who's ever taken birth control pills could tell you: It's easier to stay on them when you aren't running out every few months. Most private and public health insurance plans in the U.S. still put a limit on how many months worth of pills can be prescribed at a time because years ago doctors thought the drug might cause serious health problems. Even though we now know that the pill is generally safe, women are usually still required to get their prescription renewed every few months because doctors fear that you won't ever come in for an exam if you don't need birth control pills. In addition to infantilizing women, a new clinical trial found this makes them more likely to stop taking the pill. According to Reuters, the research involved 661 girls and women at a family planning clinic in New York City. 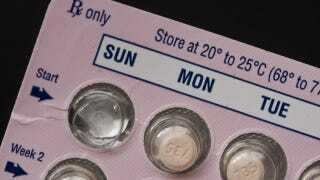 The patients received either three month or seven-month supplies of birth control pills. Six months later, 51 percent of the seven-month supply group were still taking the pills, compared to only 35 percent of the group that had fewer pills at a time. It's obvious that not having to beg your doctor for another month's supply when you accidentally run out boosts adherence. However, lead researcher Dr. Katharine O'Connell White of Tufts University School of Medicine and Baystate Medical Center says, "You need to do the research to confirm it." The study, which was published in the journal Obstetrics & Gynecology, didn't look at pregnancy, but earlier this year another study found that women were less likely to have an unplanned pregnancy when they had a year's supply of pills. Out of every 1,000 women who participated, 30 who had one to three-month supplies were pregnant within a year, versus only 10 who had a year's supply. In addition to running out of pills, many women also said they stopped taking them because they were worried about side effects. Many symptoms, such as weight gain or spotting between periods, either aren't caused by the pill or could be managed by changing the dosage. Some women don't know that, so they just stop taking them. It seems what would really make the pill more effective is allowing women to have a longer supply of birth control pills, and providing more education on side effects. However, that plan would require the medical community to start trusting that women are smart enough to take care of their reproductive health, so don't expect to see that shift anytime soon.